Fashion Necklace. 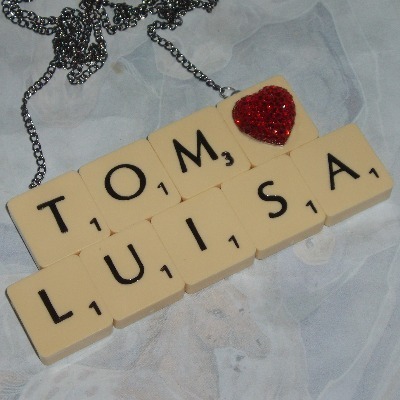 Handmade and Personalised with two rows of Letters on a 24" Annodised Silver Plated chain. Price from £8. This Scrabble necklace is perfect for the Bride on a Hen Night, for a special person, or just with two sets of initials or names for fun. The Vintage Scrabble Tiles are securely glued together. Matches the Scrabble Ring. Choose the correct number of letters you want, from 4 up to 10. Leave a message in the comments box at checkout if you want a heart cabochon on a blank tile, if you have selected one. Photograph shows a 9 letter necklace with a heart cabochon on the blank, costing £27. I recycle Vintage Scrabble letters so you will receive a necklace made using thick round-back black letter tiles. IMPORTANT - J's and K's are sometimes in short supply, so any jewellery with these letters may take up to 10 working days to process and dispatch. Normal dispatch for all other letters is approximately 4 working days.